UK inflation data, Mario Draghi and Janet Yellen’s speeches, US Retail sales, Unemployment and manufacturing data are the major events on our calendar for this week. Here is an outlook on the main market movers coming our way. Last week, despite continuous positive US data, the FOMC minutes defied expectations for a possible rate hike in the near future, sending the dollar down. The minutes revealed a debate on the necessary normalization period, which the hawks considered too long. Fed minutes also showed that some policymakers feared a stronger dollar will generate downward pressure on inflation and that global economic growth is on a downward trend. Will the dollar continue to decline? Eurozone German ZEW Economic Sentiment: Tuesday, 9:00. German investor confidence declined to a 21 month low of 6.9 in September following a 8.6 reading in August amid stronger political tensions in Europe. Analysts expected an even lower figure of 5.2. This was the lowest reading since December 2012. German economy slowed down in the third quarter which may weaken growth in the second half of the year. German investor confidence s expected to plunge to 0.2. Mario Draghi speaks: Wednesday, 7:00, 18:00. ECB President Mario Draghi will speak in Frankfurt at two occasions. He may talk about the ECB’s efforts to raise inflation to normal levels and the planned QE. Market volatility is expected. US Prelim UoM Consumer Sentiment: Friday, 13:55. The preliminary September reading of University of Michigan’s consumer sentiment soared to 84.6, the highest since July 2013, following 82.5 in the final August reading. Despite consumers’ fears of a slowdown in employment growth, anticipations were high on wage expansion. Consumer expectations jumped to 75.6 from the 71.3 reading last month and above a forecast of 73.0. Consumer sentiment s expected to reach 84.3 this time. The Dollar finally took a breather this past week. After 12 consecutive weeks of climb, the Dow Jones FXCM Dollar (ticker = USDollar) fell 0.7 percent. Yet, we shouldn’t be too hasty in calling for a full-scale reversal just because the record-breaking advance has been called to a close. Fundamentally, the greenback could be considered ‘stretched’ if we evaluated it on its more active drivers: the mass depreciation of its major counterparts and a build in interest rate expectations for the Fed. Yet, if this currency’s – and financial system’s – most omnipotent theme rears its head, we may have only seen its opening move. That theme: risk trends. The FX market considers the US currency a ‘safe haven’. However, that does not necessarily mean that the Dollar will simply rise with every slip in equities or lurch from a volatility index. This particular player’s haven status reflects a more extreme sentiment. The USD is the most abundant reserve currency and the Treasury and money markets that it fronts are considered international standards for stability. Functionally, that means the Dollar’s appeal in the spectrum of sentiment really keeps in when investors demand liquidity – when the consideration for ‘return’ evaporates. In the past five-and-a-half years, we haven’t seen many bouts of panic sweep over the global financial system and trigger the blind rush to liquidity. The market seizures in mid-2010 and mid-2011 are arguably the most prominent. Aside from these periods, ‘risk aversion’ has fallen comfortably within the constraints of complacency. The markets retreating just enough to draw short-term and opportunistic traders into the market to bid the dip and sell the risk premium. Hitting the level where the undercurrent changes and the ranks finally unwind in a meaningful way requires a scope and intensity. What we have seen last week may signal that long-awaited fraction in the serene backdrop. We have watched as implied (expected) volatility measures have climbed over the past 2-3 months, while some of the financial systems more volatile risk assets (Emerging Markets, high-yield) and growth dependent assets (Euro, commodities) have been in retreat as well. This is evidence of scope – where sentiment is leading the way rather than just a localized or isolated situation in one area of the system. Scale, however, has remained ever elusive. Perhaps that is changing though. We ended this past week with the most stubborn of risk benchmarks – the S&P 500 – closing below its incredibly consistent trend channel floor going back to January 2013. Is this simple technical cue the definitive shift in sentiment? No. A trend over half a decade in the making, will also take time to turn. Yet, we could very well be at the opening stage of the acceleration phase in that turn. Should we take that next step, an unwinding of risky positions and record leverage against a backdrop of thin open interest will heighten the demand for liquidity (stability). That is where the dollar would shine. As we monitor the ‘risk’ theme closely, it is important to keep in mind the currency’s other primary fundamental avenues. If the spark doesn’t catch, the US rate speculation has stabilized after initially wavering on the dovish Fed meeting minutes. Officials’ remarks suggest they are still heading towards hikes and the calls for deferring a hike until end of 2015 or later are very few. Data in the week ahead poses limited volatility threat to this consideration. Alternatively, risk aversion would likely push back the lift off, but the Dollar would still gain through its safety appeal. As for the weakened position of its counterparts, the unflattering growth forecasts and warnings issued for the Eurozone, Japan and China keep this a bullish greenback lever whether sentiment collapses or not. The Japanese Yen surged versus all major counterparts as the US S&P 500 saw its worst weekly decline in over two years. There’s little economic event risk out of Japan in the week ahead, but we think big things stand on the horizon for JPY pairs. Traders pushed the Japanese Yen to fresh multi-year lows versus the US Dollar as broader financial markets soared, but a clear flight to safety warns that the JPY may soon regain favor. Typically we would favor the traditional safe-haven in the US Dollar through times of market turmoil. Yet the clear fact is that speculators remain extremely short the Yen and long the dollar (long USDJPY). This in turn suggests that the Greenback could actually do poorly if we see further stock market tumbles and a broader deleveraging across leveraged assets. 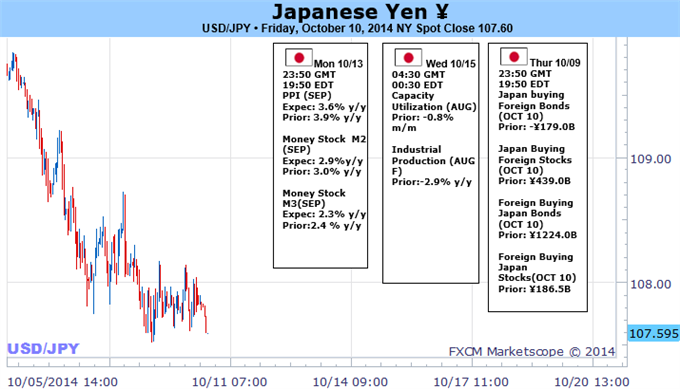 A virtually empty Japanese economic calendar in the week ahead suggests that few expect major JPY moves. Our Senior Technical Strategist nonetheless warns that the USDJPY may be nearing a significant breakdown. And indeed we say this: don’t fall asleep on the Yen. It could very well be that this is a minor S&P 500 correction within a much larger bull trend. Yet we can’t rule out a larger pullback, and we believe the JPY could surge if this is indeed the start of a larger market correction. The GBP/USD may continue to carve lower-highs & lows in the week ahead should the fundamental developments coming out of the U.K. economy further dampen interest rate expectations. The U.K. Consumer Price Index (CPI) may mark the lowest print since 2009 as the headline reading is expected to slow to an annualized 1.4%, and the diminishing threat for inflation may heighten the bearish sentiment surrounding the British Pound as the Bank of England (BoE) remains in no rush to normalize monetary policy. It seems as though we will continue to see a 7-2 split within the Monetary Policy Committee (MPC) amid the limited headlines surrounding the October 9 interest rate decision, and we may see Martin Weale and Ian McCafferty continue to serve as the minority throughout 2014 as wage pressures remain largely subdued. However, the September Jobless Claims report may generate a greater rift within the BoE as Average Weekly Earnings are projected to uptick for the first time since March, and a strong rebound in wage growth may renew bets for higher borrowing costs as the central bank continues to take note of the stronger-than-expected recovery in the labor market. With that said, the inflation outlook is likely to heavily impact the British Pound next week as BoE Governor Mark Carney retains a rather balanced tone for monetary policy, and the central bank may have little choice but to pay closer attention to the recent wave of U.S. dollar strength as the depreciation in the exchange rate raise the risk for imported inflation. As a result, the GBP/USD remains vulnerable to a further decline, especially as the Relative Strength Index (RSI) retains the bearish momentum carried over from back in July, with the next key downside objective coming in around the 1.5900, the 50.0% Fibonacci expansion from the 2009 lows. The Australian Dollar consolidated against most of its major counterparts for the week with plenty of intraday swings against its US namesake. A status-quo RBA rate decision and dubious set of local employment figures offered the currency few fresh cues. Additionally, elevated volatility levels kept the bulls at bay and hindered a recovery for the high-yielding currency. Next week brings domestic Consumer and Business confidence data as well as Chinese Trade Balance figures. However, the regional economic releases may do little to shift well-anchored RBA policy bets. This in turn may generate another lackluster response from the AUD to the figures. Local economic prints continue to play second fiddle to other guiding factors including the ‘risk-off’ theme that has gained traction in recent weeks. Investor nervousness and heightened volatility may continue to detract from what has actually been a relatively stable yield advantage for the Aussie. This could limit the scope for a recovery and keep AUD/USD capped below the 90 US cent handle over the near term. Further, positioning amongst speculative futures traders remains well-above last year’s extremes despite recently flipping to net short. This suggests there is plenty of room in the AUD short trade before it begins to look crowded. Downside risks remain centered on the 0.8660 floor, which if broken on a ‘daily close’ basis could open the next leg lower to the July ‘10 low at 0.8320. A quiet economic calendar on the domestic front is likely to see the New Zealand Dollar price action fall in with broad-based risk appetite trends in the week ahead. That probably spells volatility for the sentiment-geared currency as heretofore complacent investors begin to see a perfect storm of risk aversion gathering on the horizon. The markets appeared to be taking the approaching end of the Federal Reserve’s QE3 asset purchase program in stride until relatively recently. While the swell in risk-geared assets has been closely linked with the US central bank’s generous stimulus efforts, traders seemed content enough with the post-Q1 recovery in US economic news-flow to believe that asset prices need not necessarily unravel after liquidity injections are wound down. This relative calm appears to be giving way as policymakers from seemingly all directions sound the alarm about “frothy” valuations while global growth bets fizzle. Fears of another recession in Europe coupled with a deep slowdown in China had been somewhat muted amid hopes that a robust US would amount to a strong-enough countervailing force. Such rosy notions were notably upset last week as minutes from September’s FOMC meeting revealed concerns about contagion. The churn continues in the week ahead. In the US, speculation about the length of the time gap between the end of QE3 and the first subsequent rate hike will be informed by September’s PPI data. On the growth front, Retail Sales and Industrial Production figures as well as the Fed’s Beige Book survey of regional economic conditions will help inform bets on whether the US is strong enough to hold up global demand as output elsewhere falters. Meanwhile, a Chinese Trade Balance and CPI readings will help to gauge just how deep of a slump is developing in the East Asian giant and what might be done about it. The inflation gauge seems like it might draw particular attention, with a softer print likely to be seen as opening the door for Beijing to expand policy support, and vice versa. On balance, the path of least resistance seems to favor risk aversion. It seems altogether naïve to think that risky assets will happily resume a steady advance even as the Fed withdraws its helping hand and growth forecasts are roundly slashed. Timing such reversals is notoriously difficult however, and it remains unclear if the week ahead will ultimately deliver the seemingly inevitable breakdown. A bout of volatility is almost surely in the cards however, with swings risk appetite set to be mirrored in Kiwi performance. Gold prices are markedly higher this week with the precious metal rallying more than 2.5% to trade at $1221 ahead of the New York close on Friday. The advance marks the largest weekly rally since mid-June and comes amid a surge in volatility with back to back triple-digit swings in the Dow and steep losses in European equities. As fears of a global slowdown begin to take root, recent comments from the Fed have started to push out interest rate expectations with gold likely a beneficiary in the near-term. The release of the minutes from the latest FOMC policy decision on Wednesday cited concerns among Fed officials with regards to the global slowdown while noting that the stronger dollar may dampen inflation and hamper exports. 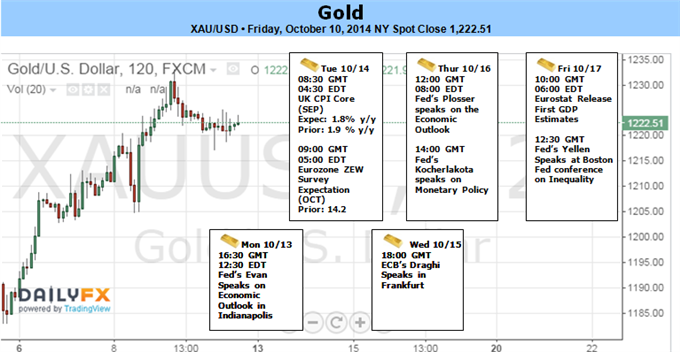 The dovish tone fueled demand for gold as markets rallied on expectations that the central bank may need to delay the normalization process. Equity gains were pared the following day however with the SP 500 posting a 2% decline as gold stretched into fresh monthly highs. Looking ahead to next week, the attention shifts back to the US data stream with retail sales, industrial production, the University of Michigan surveys, housing numbers and the release of the Fed’s Beige Book on tap. With the recent downturn in equities and continued concerns regarding the recent USD rally, weaker data could further fuel strength in gold in the near-term. With that said, we would need to see a strong batch to cap this recent advance with the longer-term outlook remaining weighted to the downside. Look for possible strength in the coming weeks to likely offer more favorable short entries. From a technical standpoint, gold continues to trade within the confines of a descending Andrew’s pitchfork formation with the monthly low coming in right at the rebound off pitchfork support. Prices are now nearly 4.5% off the lows and we’ll look for a breach above $1222/24 (on a close basis) to validate a break of the monthly opening range. Such a scenario targets resistance objectives at the June close at $1243- this level happens to coincide with the pitchfork bisector line late next week and may be relevant as the economic calendar picks back up. Interim support stands rests at $1206 with a move below this threshold shifting our focus back to the short side of the trade targeting pitchfork support and the 2013 lows at $1178/80. The dollar gained ground against most of the other major currencies on Friday amid fears over global growth, but the dollar index snapped a 12-week winning streak as the traditional safe haven yen ended the week higher. 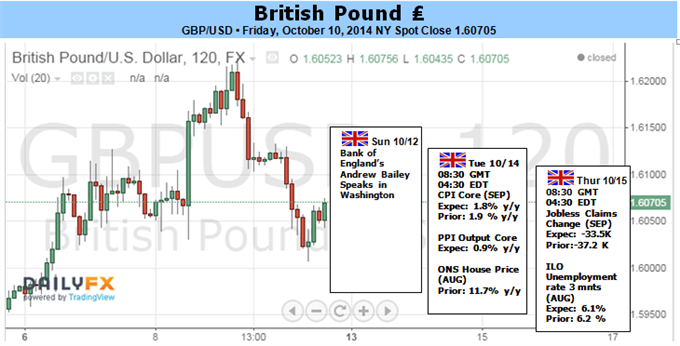 EUR/USD was down 0.48% to 1.2628 late Friday, while GBP/USD slid 0.26% to 1.6074. Market sentiment was hit by fears that Germany, the euro zone’s largest economy is being dragged into a recession after recent data indicated unexpected weakness in manufacturing and exports. Data released on Thursday showed that German exports fell 5.8% in August, and this followed weak industrial output figures on Tuesday. Earlier in the week, the International Monetary Fund cut its forecasts for global growth in 2014 and 2015 and warned that global growth may never reach its pre-crisis levels ever again. The fund revised down its growth forecasts for the euro area’s three largest economies Germany, France and Italy. Steep declines in commodity-price declines also fuelled fears that the global economy is slowing. Brent crude oil prices ell to their lowest level for nearly four years on Friday. USD/JPY was down 0.17% to 107.64 late Friday, and ended the week with losses of 1.97%. The US Dollar Index, which tracks the performance of the greenback against a basket of six major currencies, ended the week down 1% at 85.92. The move ended a 12-week rally that saw the index gain more than 8% since early July. The dollar weakened on Wednesday after the minutes of the Federal Reserve’s September meeting showed that some officials were concerned over the impact of the stronger dollar on global growth and the outlook for U.S. inflation. "Some participants expressed concern that the persistent shortfall of economic growth and inflation in the euro area could lead to a further appreciation of the dollar and have adverse effects on the U.S. external sector," the minutes said. The commodity linked dollars ended Friday broadly lower, with AUD/USD tumbling 1.10% to 0.8684 in late trade, off the two week highs of 0.8897 struck in the previous session. NZD/USD lost 0.64% to trade at 0.7812, while USD/CAD eased up 0.14% to 1.1198. In the week ahead, investors will be awaiting U.S. data on retail sales and industrial production for fresh indications on the strength of the economic recovery. Tuesday’s ZEW report on German economic sentiment will also be closely watched. China is to release data on the trade balance. Markets in Canada are to remain closed for the Thanksgiving holiday, while U.S. markets will be closed for Columbus Day. Switzerland is to report on producer price inflation. The U.K. is to produce data on consumer price inflation, which accounts for the majority of overall inflation. The euro zone is to publish data on industrial production. Australia is to release a private sector report on consumer sentiment, as well as official data on new vehicle sales. China is to release data on producer and consumer prices. The U.S. is to release data on retail sales, the government measure of consumer spending, which accounts for the majority of overall economic activity. The country is also to report on producer prices and manufacturing activity in the New York region. New Zealand is to publish private sector data on manufacturing activity, while Australia is to release a report on inflation expectations. The euro zone is to publish revised data on consumer prices for September. Canada is to release data on manufacturing sales and foreign securities purchases. The U.S. is to release the weekly report on initial jobless claims as well as data on industrial production and manufacturing activity in the Philadelphia region. Canada is to release data on consumer prices. The U.S. is to round up the week with reports on building permits and housing starts, as well as a preliminary report on consumer sentiment. The dollar was lower against the yen on Friday as concerns over the outlook for global economic growth bolstered investor demand for the traditional safe haven yen. USD/JPY was down 0.17% to 107.64 late Friday, not far from Thursday’s three week lows of 107.52. The pair ended the week with losses of 1.97%. Steep declines in commodity-price declines also fuelled fears that the global economy is slowing. Brent crude prices fell to their lowest level in almost four years on Friday. The dollar fell to three week lows against the yen on Thursday after the minutes of the Federal Reserve’s September meeting showed that some officials were concerned over a slowdown in global growth and the impact of the stronger dollar on the U.S. inflation outlook. The minutes prompted investors to trim back expectations for an earlier-than-expected hike in U.S. interest rates. On Friday, Fed Vice Chairman Stanley Fischer said weaker-than-expected global growth could prompt it to slow the pace of eventual interest rate hikes. Elsewhere, the euro fell to five week lows against the firmer yen on Friday, with EUR/JPY down 0.72% to 135.93 in late trade. In the week ahead, investors will be awaiting U.S. data on retail sales and industrial production for fresh indications on the strength of the economic recovery. Markets in both the U.S. and Japan are closed for holidays on Monday. Meanwhile, markets in the U.S. markets are to be closed for Columbus Day. The Australian dollar plunged more than 1% against its U.S. counterpart on Friday, as appetite for riskier assets weakened amid concerns over the global economic outlook. AUD/USD hit a daily low of 0.8680 on Friday, a level not seen since October 6, before subsequently consolidating at 0.8686 by close of trade, down 1.1% for the day and 0.11% lower for the week. The pair is likely to find support at 0.8651, the low from October 6, and resistance at 0.8838, the high from October 9. Steep declines in commodity prices also fuelled fears that the global economy is slowing. Brent crude prices fell to their lowest level in almost four years on Friday. Earlier in the week, the International Monetary Fund cut its forecasts for global growth in 2014 and 2015 and warned that the recovery remains weak and uneven. The dollar weakened after the minutes of the Federal Reserve’s September meeting released Wednesday showed that some officials were concerned over a slowdown in global growth and the impact of the stronger dollar on the U.S. inflation outlook. Meanwhile, in Australia, official data released Friday showed that the number of employed people in Australia fell by 29,700 last month, confounding expectations for a 17,600 increase. The report also showed that Australia's unemployment rate ticked up to 6.1% in September from 6.0% in August. On Tuesday, the Reserve Bank of Australia left interest rates unchanged at a record low 2.5% and reiterated that the Australian dollar's strength continues to dampen growth. Data from the Commodities Futures Trading Commission released Friday showed that speculators added to their bearish bets on the Australian dollar in the week ending October 7. Net shorts totaled 26,486 contracts, compared to net shorts of 2,017 in the preceding week. In the week ahead, investors will be awaiting U.S. data on retail sales and industrial production for fresh indications on the strength of the economic recovery. Markets in the U.S. will be closed for Columbus Day. Australia is to release a report on inflation expectations.